Editor(s): Mickaelian, A. M., Harutyunian, H. A., Nikoghosyan, E. H.
Byurakan, Armenia, 19–23 September 2016. Many astrophysical processes and phenomena prove that our Universe is very dynamic. The study of the instability of stellar and extragalactic objects has always been the main direction of research at the BAO. 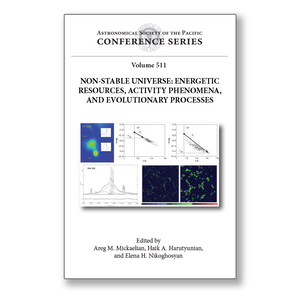 The International Symposium Non-Stable Universe: Energetic Resources, Activity Phenomena, and Evolutionary Processes brought together solar, Galactic, extragalactic, and theoretical astronomers with involvement in astronomical surveys to report and discuss important results and major advances related to instability phenomena in the Universe. The meeting topics included , energy sources, instability and activity phenomena, cosmic evolutionary processes, and future projects and surveys that will reveal more about our changing Universe. The articles in this volume present the Universe as a changing system that should be studied and understood dynamically. They cover all aspects of 70-years of research in Byurakan and emphasize the studies of instability phenomena.This volume will be useful for researchers in the fields of stars and nebulae, galaxies and cosmology, theory, and astronomical surveys.